With Tokyo Game Show behind us, it's time to move on to the flood of Q4 releases. That would explain Banjo Kazooie: Nuts & Bolts and Fable II being unceremoniously plopped on the stoop of Kotaku Towers West. Both will get a good gameplay session thrashing this weekend from yours truly and then ultimately reviewed — as will as the recently acquired Portal: Still Alive — but there are some non-obligation games here too. Finally picked up Call of Duty 4 (I know, I know), The Legend of Zelda: Twilight Princess (I know!! 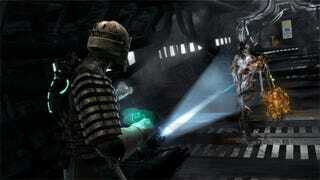 ), LittleBigPlanet and Dead Space. So many games! I'm going to put in a request for some time off from my job writing about games to play some of these games. How about you? Halloween parties planned this weekend?